There is a small town on the Pacific Rim set within spectacular scenery – snow-capped mountains with glaciers streaming down to the ocean, thickly forested mountains, houses rising up the hill sides and 40 miles of paved road. There is no way out of this small town except to take a plane, boat or hike. The closest overland connection to the rest of the continent is hundreds of miles away. This must be a small town in a very remote area? 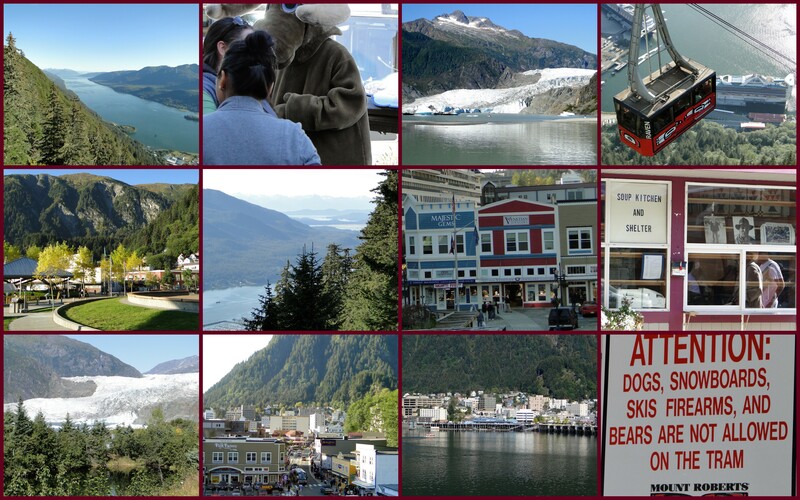 It is – it’s the capital of Alaska, Juneau. If Alaska was an independent nation – sorry AIP it’s unlikely – it would be the 17th largest in the world, but with less than 700,000 residents it would be one of the least populated on Earth (1 person per square mile). If you want to drive to Alaska from the lower 48, you will start at the Canadian border just south of Vancouver and travel over 1,700 miles through Canada’s British Columbia and the Yukon to Skagway at the northern end of the Inside Passage – same starting point for the Yukon Gold Rush of 1897-1899. To Anchorage it’s another 800 miles. I had never taken a cruise. I had never wanted to take a cruise for the same reason that I have never wanted to stay in an all-inclusive resort. 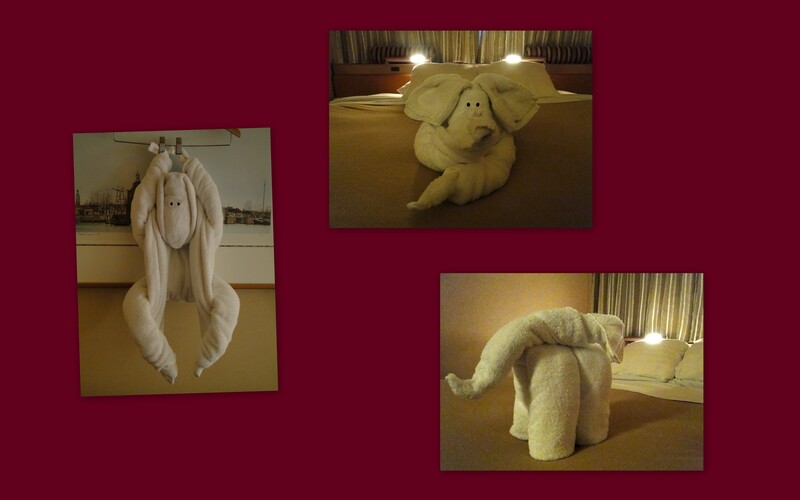 Not that I don’t enjoy luxury with all the pampering that goes with that experience, but travel for me is discovery. I want to walk and explore. Six hours in port is not exploring, unless the port happens to be no larger than the suburban towns in which many middle class Americans live – Juneau, Sitka and Ketchikan fit the bill. 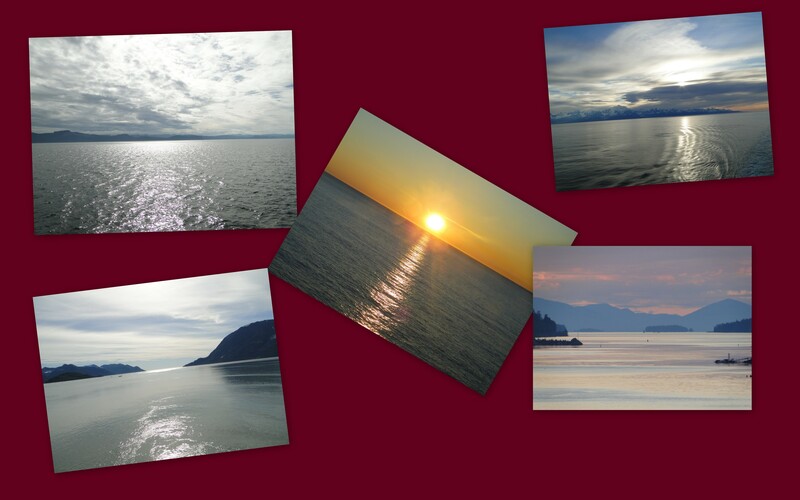 Yet I knew that if I wanted to experience the breathtaking beauty of Alaska’s Inside Passage I had few choices – travel by floatplane, fishing boat, the Alaska ferry service or take a cruise. 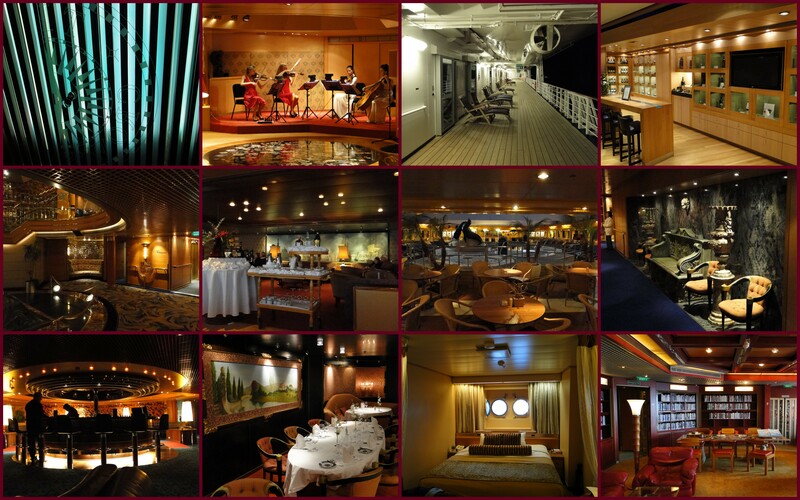 Frankly, the cruise was the least expensive – if less adventurous – mode. 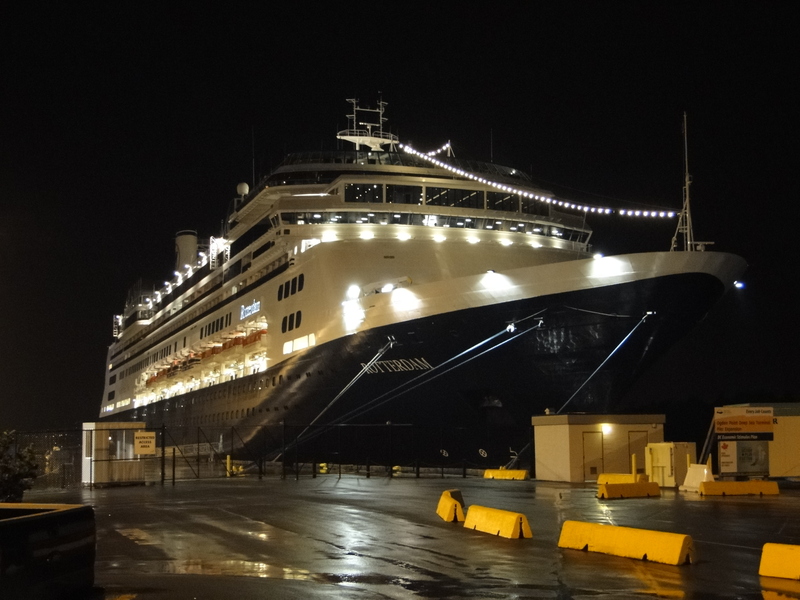 Holland America Line’s Rotterdam is the sixth in an over century long line of flagships designed for trans-ocean travel. It’s not a mega-ship holding just 1300 passengers. Its Dutch officers and Indonesian/Philippine crew are superb with a terrific sense of humor (I now must visit Indonesia!). Passenger demographics cover a wide cross section of society and the world but basically fall into two categories: those interested in travel and those interested in consuming enormous quantities of food, drink and bingo. A passenger can eat 24-hours a day (I am not exaggerating), and fortunately there are many venues where fine food with sensible portions are available. The Lido buffet was not one of those venues. 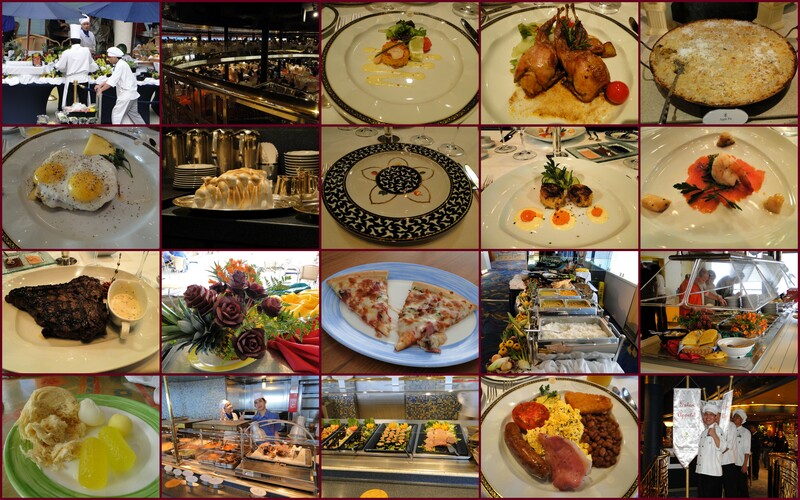 Upon boarding the ship in Seattle, lunch was available only at the buffet. My first experience watching a woman in front of me eating from her plate, on the line, while waiting for the next plate was enough. The La Fontaine main dining room was spacious with both excellent service and sensible portions with imaginative menus – grilled quail, lamb chops, and ethnic breakfast items. The premium Pinnacle Grill ($20/per person surcharge for dinner) was elegant but a 22 oz. (size was not indicated on the menu) aged steak was overcooked and absurdly large. Twenty-four hour room service, a pizza parlor and an all day taco buffet – as well as many drink bars – were all available. Passenger behavior on the ship ran the social scale as well – from T-shirts and shorts in the dining room at night, propping bare feet on polished tables in the lounges, complaining about the Indonesian/Philippine accents, to appropriately dressed and behaved people enjoying the stunning scenery, the library and the many cultural opportunities Holland America provided. I believe there is a “time and a place for everything” but watching some passengers act out “The Jersey Shore” does not make me comfortable. Profits also flow to the cruise lines through excessively expensive excursions – from $400/person helicopter flyovers of glaciers to $55 bus trips to areas within a few miles of dock – the public transportation to the same areas cost a couple of bucks. Once I learned to ignore boorish behavior and excessive marketing, enjoying the unique beauty of Alaska’s Inside Passage and its villages – hardly cities – dominated my mind as the reason for the cruise. 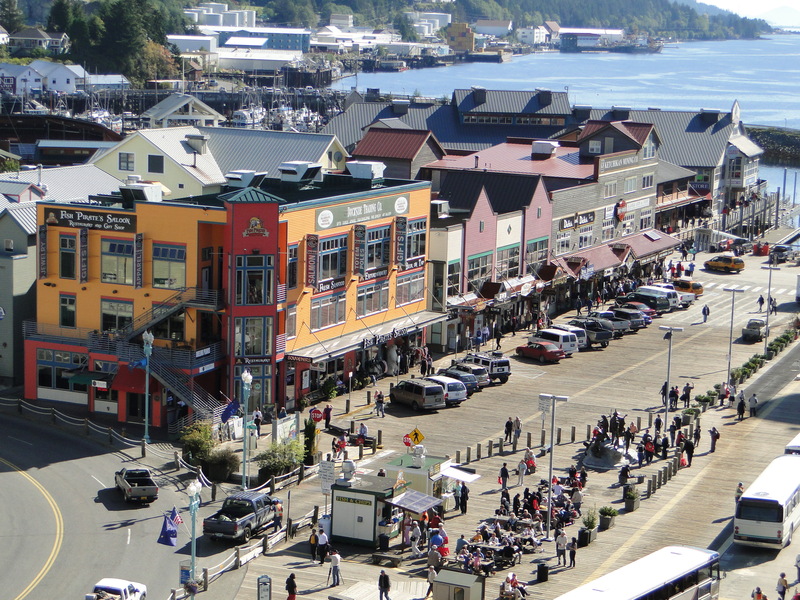 Juneau (31,000), Sitka (8,900) and Ketchikan (7,400) have a rough and tumble history worthy of a frontier – Juneau being the state capital still has a “rough and tumble” present… Cars, especially trucks and SUV’s, choked the streets even though each town has an average of 30 miles of paved roads – and not that many unpaved ones either. 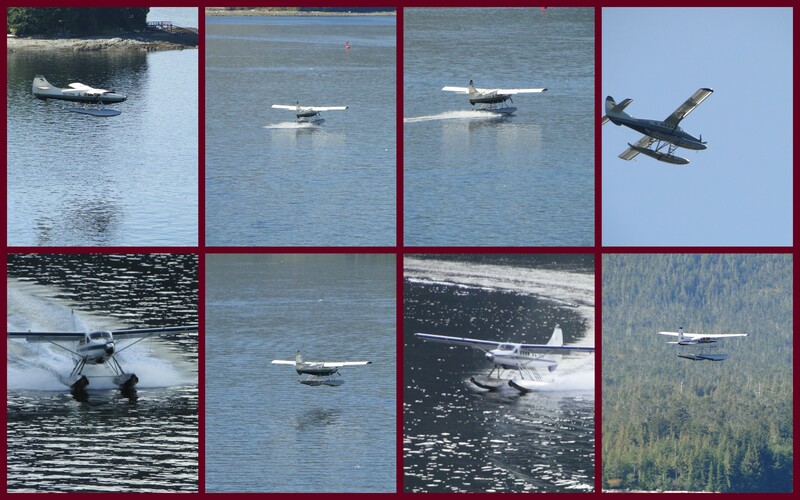 I was reminded that several years ago there was significant national controversy over the “Bridge to nowhere.” That happened to be the proposed Gravina Island Bridge that would connect Ketchikan to Gravina Island – which contains the Ketchikan International Airport – much safer than Juneau’s which has been cited as one of the ten most dangerous on Earth (jets take off and land facing a mountain that’s way too close!) I guess any bridge would be to “nowhere” unless it happens to take you home, or to the only airport, without taking the heavily subsidized Alaskan ferry service – but, what do you want, that’s politics. Each of these three towns has several ultra-modern bridges connecting the main town to what seems to the casual tourist to be “nowhere” – forested mountains – obviously this one was just another political football. Juneau has one reason to visit – I’m ignoring the shopping or the incongruous Victorian wooden Governor’s Mansion – and that’s taking the Mt. Roberts Tramway up 2,000 feet ($27.00/round trip) to learn about the slaughter of Alaska’s Eagles and see an informative film. The Raptor Center is a non-profit organization dedicated to rescuing as many as possible of the over 100,000 Alaskan Bald Eagles that are shot for sport by Alaskans every year (interestingly Alaska tourism does not like this getting out – I was told this information by a volunteer at the Raptor Center. The tourism office wants you to believe they were hit by cars…?). Several miles out of town (a $6.00 public bus ride rather than the “many times more” cruise excursion) is the rapidly retreating Mendenhall Glacier – fortunately there are still 100,000 Alaskan glaciers, not all retreating. If you’re never going to see a glacier again in your life, it’s worth a visit to this very small example. (I do not understand why the National Park Service charges admission to the Visitor’s Center?). 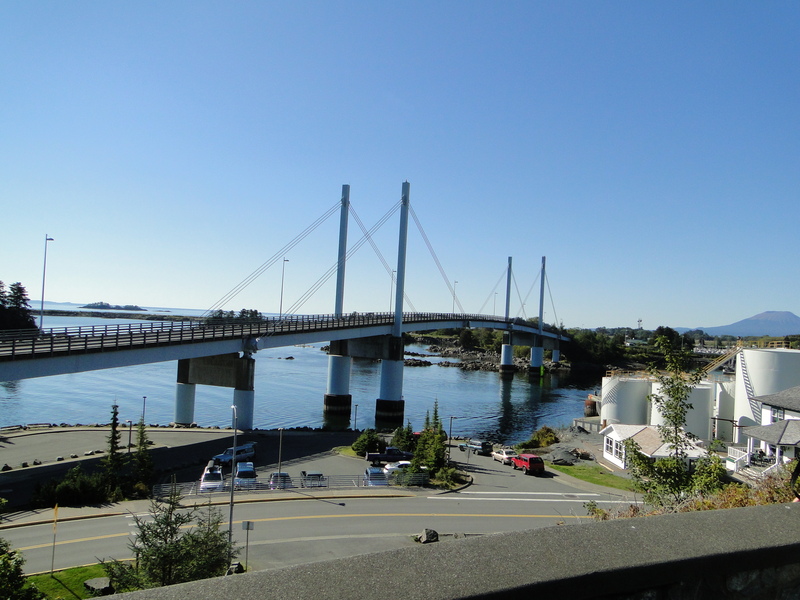 Sitka has a bit more history having been the capital of the Russian Empire’s Alaskan territory until its sale to the USA in the 1870’s. Same shopping, but it has a lovely waterfront park walkway that takes a visitor to the National Park Service owned early 19th century Russian Orthodox Bishop’s residence, and you can continue to walk or ride an inexpensive public bus to the Sheldon Jackson Museum – stunning collection of Tlingit art – and the Sitka National Historical Park with its excellent film, exhibits of North Coast art and history, Totem park walk and beach site of the 1804 victory by the Tlingit’s over the Russian invaders. Unique in Alaska is the presence of a considerable number of Russian descendants of the original settlers that form the congregation of the all wooden St. Michael’s Cathedral. Now don’t think “cathedral = large.” St’ Michael’s is not only very modest in size, but the current building is a reconstruction after the great Sitka fire of 1966 that destroyed much of the town. 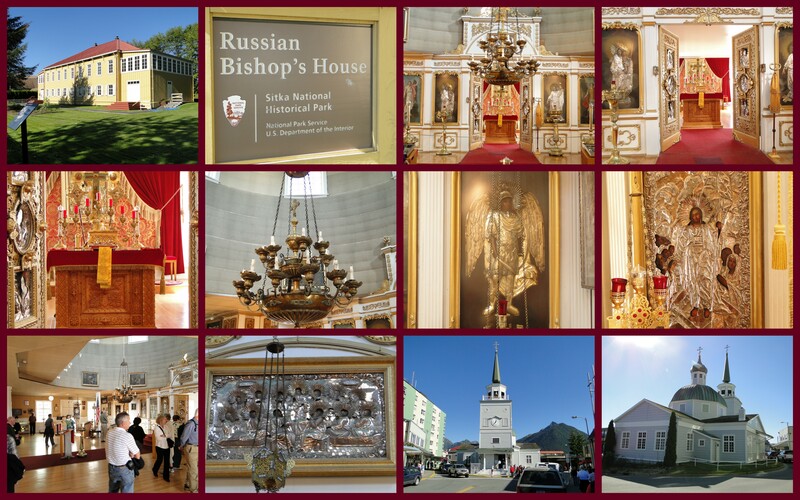 Miraculously, Sitka residents rescued all but one of the priceless 19th century Russian Orthodox art objects – including decorated doors and panels – before the church was consumed by flames. Across the street is the very simple, and equally old, Lutheran Church which was burned three times before reconstructed in concrete. 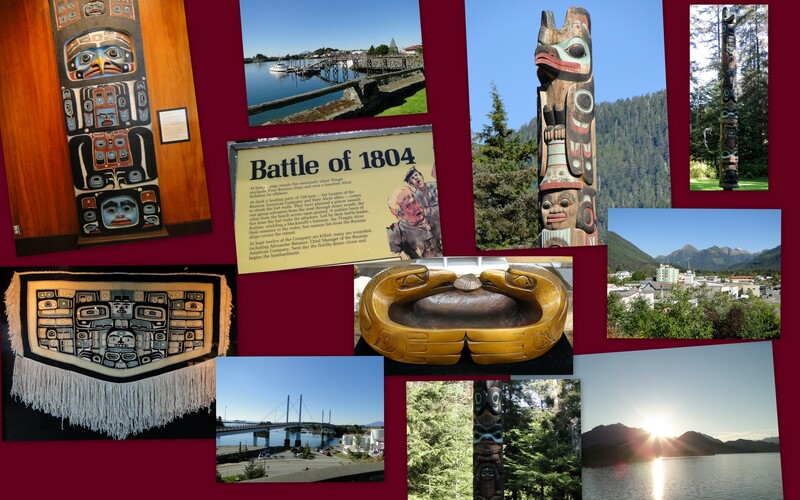 Ketchikan is interesting in two aspects: Alaska’s most famous and former, Red Light District, and Saxman village – the heart of the Tlingit totem pole art revival. 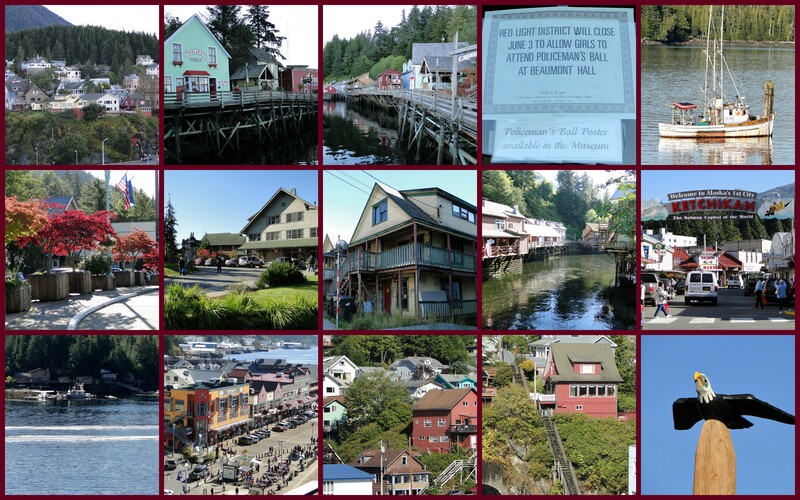 As a rough and tumble fishing port, Ketchikan was known for over a century as the place where both “salmon and fishermen came to spawn.” Creek Street Historic District (the old Red Light district is an elevated series of 19th century and early 20th century wooden structures of tourist oriented stores and excellent, but very expensive, art galleries as well as the Dolly House Museum dedicated to its own history and honoring the “working girl.” The policeman’s ball sign in the collage is accurate. 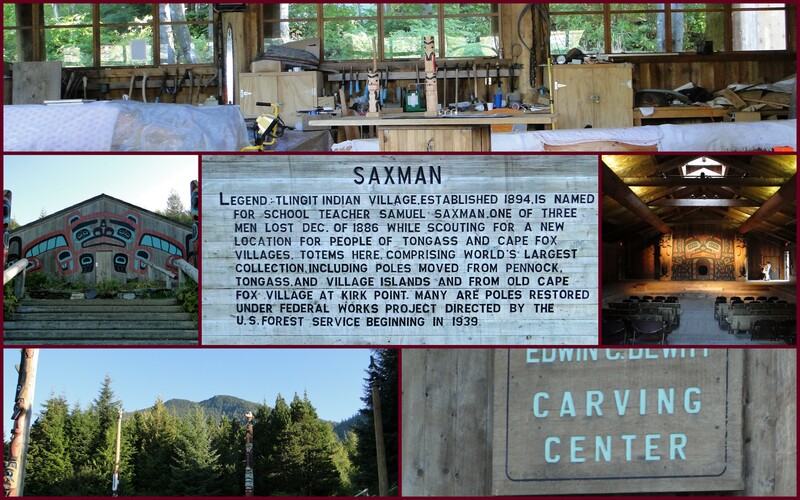 Saxman village, a couple miles out of town by public bus, is dedicated to the art of the totem. Mistakenly, and tragically, identified by Christian missionaries as “pagan idols,” these monumental visual genealogies and historical essays – in cultures without written languages – survive only 100 years on average in the very humid environment of the North Pacific Coast Rain Forest. Antique survivors are in museums only. 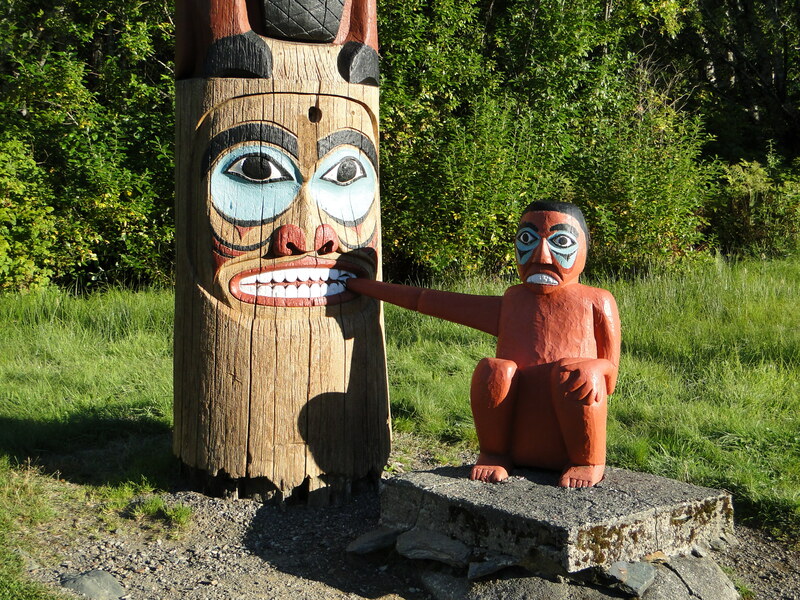 The continuation of the totem tradition is both inspiring and maintains Native humor as well. Floating slowly past pristine landscapes is the reason to take a cruise along Alaska’s Inside Passage. Having seen and walked quite close to glaciers in the Andes Mountains, I was surprised that a ship as large as the Rotterdam could sail within ½ mile of the vast Hubbard Glacier – still growing. Running commentary by both National Park Service rangers and Tlingit elders made the cruising tour the highlight of the trip! After several hours of observation, the ship turned away from the glacier and I entered one of its hot tubs. 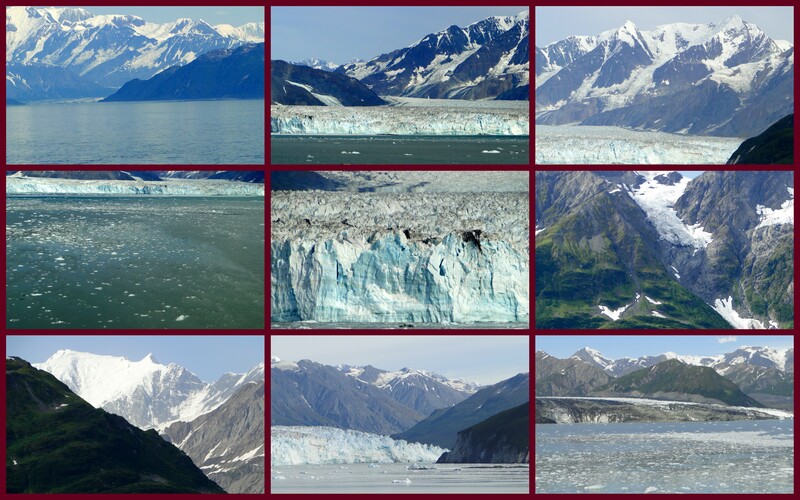 I must admit, sitting in a hot tub, with a chilly breeze on my head swirling the hot steam while the Hubbard Glacier retreated in the background seemed a perfectly normal justification for luxuriating in total sensual decadence.